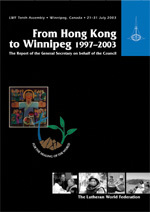 "From Hong Kong to Winnipeg," the report of the General Secretary on behalf of the Council, gives an account of the life and work of the Federation, including the decisions of its governing bodies over the past six years, as provided for in the LWF Constitution. Highlights of the work carried out by the diverse LWF departments and offices during this period are included. The Six Year Report is provided to all participants registered for the Assembly.